Peru has signed a $400 million deal to buy 24 Mil Mi-171 transport helicopters for its military, Peruvian media reported Friday. Delivery of the helicopters will begin from the second half of next year and be completed in 2015, the Peruvian Times reported. Russian daily Kommersant valued the contract at $500 million. The deal will also include a flight simulator and establishment of a Russian-operated maintenance center in Peru by 2016. Peru already operates Russian Mi-17 transport and Mi-35 attack helicopters. Earlier in August this year, President Vladimir Putin indicated that Moscow will allocate 36 billion rubles ($1.12 billion) for the development of Russia’s civilian helicopter manufacturing industry. “In order to support the civil helicopter industry specifically, the federal budget will allocate about 36 billion rubles to it by 2020,” Putin said after he chaired a meet on outlook for Russia’s helicopter manufacturing sector. 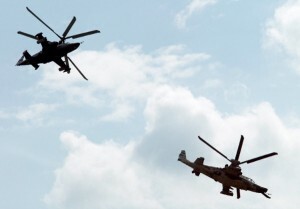 Russia’s emphasis on helicopter production is part of its economy modernization drive. The Peru deal was agreed during a visit to Lima in October by Russian military officials, according to Kommersant. The sale is the latest in a string of commercial successes in Latin America for Russian Helicopters. State-run Russian Helicopters, one of the leaders in the domestic industry, have orders from foreign and domestic markets totaling 870 helicopters worth 388 billion rubles ($11.8 billion) through to 2020. Argentina, Brazil, Chile, and Venezuela have all purchased Mi-17 or Mi-171 helicopters from Russia in recent years. Lima may also soon conclude deals for more military hardware from Russia worth up to $2.3 billion, including air defense systems, Kommersant said citing Russian defense industry officials.